Another outstanding evening of water polo is due in Budapest where Champions League winner Olympiacos Piraeus (GRE) clashes with Euro Cup-holder FTC-Telekom Budapest (HUN) for the European Super Cup. The Greeks eye a second trophy after 2002 while the Hungarians, playing in their home pool, try to halt the Champions League winners’ run of 19 consecutive victories and claim the Super Cup again after 1980. Two top European sides, fielding star-studded line-ups, are to clash Friday evening in Budapest for the men’s European Super Cup. 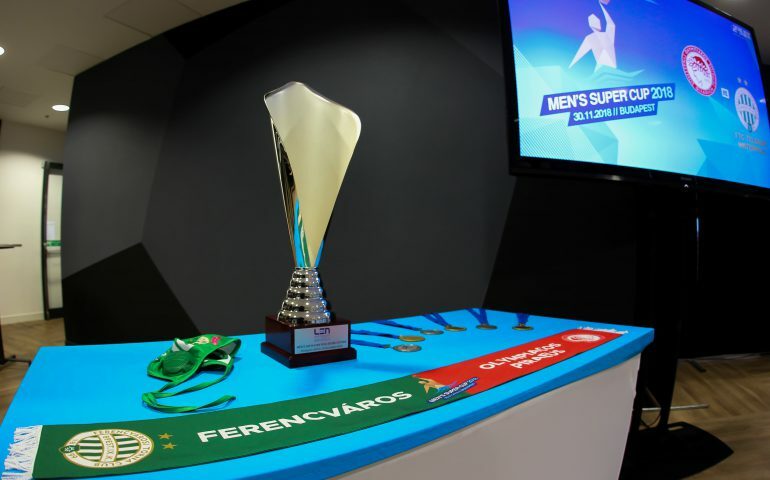 “It’s going to a real celebration of water polo” everyone emphasised that in the pre-game press conference, held in the magnificent Groupama Arena, state-of-the-art home of Ferencvaros’s football team. As LEN Bureau Water Polo Liaison Aleksandar Sostar and TWPC Chairman Gianni Lonzi highlighted, two outstanding teams of European water polo will play a tremendous game which is going to be a real entertainment for all water polo loving people. The new President of the Hungarian Water Polo Federation Attila Vari said that Hungary was always honoured to welcome top European water polo events, this Super Cup final is another great occasion but the locals had already started the preparations of another big LEN event, the 2020 European Championships. The game starts from 20.00 in the famous Komjadi Pool, free live streaming will be available on the LEN website. Olympiacos returned to the top of the continent after 16 years, thus will play for this trophy for the second time in its history. The first one also happened against a Hungarian team, in 2002 the Greeks bettered Vasas 6-5 to add the Super Cup to their treasury. Ferencvaros has a ‘richer’ past in this regard as they had two Super Cup wins back in 1978 and 1980 – those were two rare occasions when the team coming first in the Cupwinners’ Cup could defeat the European champion side (since 2003 the Euro Cup/LEN Trophy winner plays for the Super Cup). The all-time records show an overwhelming 27-9 lead of the Champions League winners, and in fact the holders of the most prestigious trophy has a 19-match winning streak in the finals. The last time the ‘other’ side could beat the champions dates back to 1993 when Pescara (ITA) upset Jadran Split (CRO). Ferencvaros, back-to-back winners of the Euro Cup, was very close to halt this run a year ago when they forced a penalty-shootout against the other Magyar team Szolnok but they couldn’t upset the Champions League title-holders at the end (6-6, pen: 4-2 for Szolnok – that was the first time when penalties decided the Super Cup). Friday evening offers another chance for Ferencvaros, though it’s going to be a tough challenge, especially because Olympiacos was quite successful while playing in Budapest – both their first Champions League and Super Cup wins in 2002 were achieved in the Hungarian capital. The women’s Super Cup final has already seen the “second-ranked” cup-winners beating the European champions, and indeed that was a Hungarian team: LEN Trophy-winner Dunaujvarosi Foiskola came from four-goals down to beat Euro League-winner Kirishi (RUS) in a penalty shootout (11-11, pen: 2-4).